SEOUL, South Korea, April 16, 2018 /PRNewswire/ — JLK Inspection (JLK), the Seoul–based deep learning and artificial intelligence company, announced that after extensive research and development, it has achieved a major milestone in the development of a technology for assisting in the diagnosis of ischemic strokes, which can provide key information to determine treatment. JLK is a member company of the K-ICT Born2Global Centre. JLK Inspection recently completed clinical trials for its AI-based stroke diagnosis platform, which is designed to assist doctors in quickly classifying the cause of a stroke. When a patient comes to the hospital with a suspected stroke, the very first step doctors need to tackle is to determine what kind of stroke they are seeing: is there bleeding in the brain or a blockage that prevents blood flowing to the brain? Most cases are identified as ischemic strokes, which occurs when a blood vessel is blocked by a clot, obstructing the blood flow in the brain. Treatment of ischemic strokes starts with classifying the cause of the stroke, which is not only difficult task but also carries the risk of causing serious damage or even death to the patient if the stroke’s cause is misclassified by the physician. Approximately one in six people are at risk of suffering from a stroke, but it is a predicable condition which can be cured with appropriate treatment following proper diagnosis, which is highly dependent on analysis of image data. According to Wontae Kim, CEO of JLK Inspection, this is why the company chose to specialize in this area. JLK recently completed clinical trials for its AI–based stroke diagnosis platform, which is designed to assist doctors in quickly classifying the cause of a stroke. According to Kim, "It is inspiring in that, JLK Inspection has a platform for CT–based hemorrhagic stroke detection as well as for MRI–based ischemic stroke diagnosis at a time when its peers are only working in the hemorrhagic stroke detection area." He also added that "fast diagnosis using our solution is essential in treating strokes, helping provide more time for faster treatment, while potentially saving lives and millions in medical expenses." JLK utilizes artificial intelligence and deep learning technologies to analyze MRI images of stroke patients to help classify the cause of a stroke. To train the AI platform, JLK has secured billions of pieces of data from millions of cases via collaborations with hospitals in Korea, including Seoul National University Hospital and Dongkuk University Hospital. JLK’s experts are working with these institutions to help train the software to analyze the provided data correctly. It is expected that JLK technology will assist physicians in classifying strokes more quickly, leading to faster and more-precise decision–making for the patient while working as a virtual "skilled assistant" to help physicians assess medical images as accurately as possible. 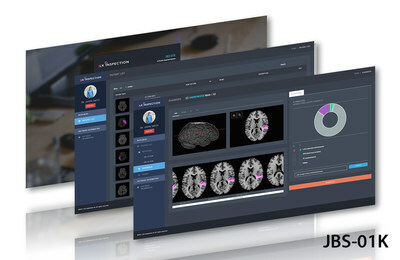 JLK INSPECTION (www.jlk-inspection.com), established in 2014, is Korean startup company specializing in combining artificial intelligence and image–processing technologies with medical expertise. The company raised USD 17MM of funding from institutional investors in Korea, is expected to clear KFDA in first half of 2018 and is currently in the process of applying to the FDA and CE. JLK Inspection is expanding its business scope to build an AI–based general and universal medical platform to cover various diseases and conditions such as dementia and prostate cancer, among others, by working in close cooperation with globally renowned hospitals and research centers. K-ICT Born2Global Centre (www.born2global.com) is a full-cycle service platform for global expansion. Since inception in 2013, Born2Global has been setting the standard for a successful startup ecosystem as the main Korean government agency under the Ministry of Science and ICT. Born2Global has expanded and transformed startups into engaged and equipped companies that are connected with the global market.